This is a rather rare pattern, without definitive attribution. 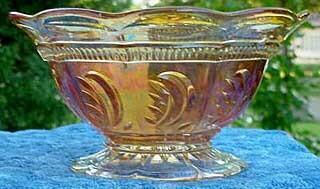 Glen and Stephen Thistlewood, in their book, A Century of Carnival Glass, speculate that Rindskopf was the maker. Only seen in marigold. I have records of just four bowls having sold at live auction: one in 1996 for $85; one in 1999 for $50; another in 2004 for $30; and the fourth in 2006 for $10. The 7 3/4-inch example shown here sold on ebay in 2004 for $50. In 2005, two on eBay brought $57 and $77. At live auction in 2006 an example brought $10. Photo courtesy of Fred Campbell.